“It will fluctuate,” J. P. Morgan once said, when asked what the stock market will do. At the time of writing, Ethereum is about to break above the $150 level, and Bitcoin is trading less than $50 away from that key $4,000 level. There is potential for a huge squeeze to materialize, especially by Ethereum—the cryptocurrency everyone loves to short and/or use as a hedge against BTC or other ERC-20 tokens listed across various cryptocurrency exchanges. The potential implications this movement could have for stablecoins is something to bear in mind if this rally continues. 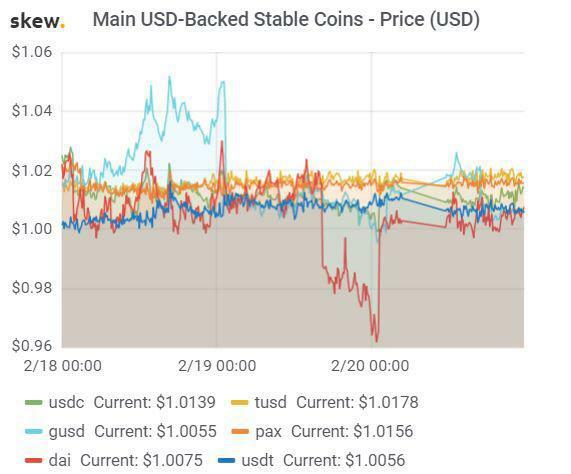 We have already seen some pretty wild swings today, with Gemini Dollar (GUSD) above 1.04 and DAI trading close to 0.96, not so stable after all. NuBits’ peg infamously broke in 2016, and it remained broken for 3 months. The initial crypto price drop happened between May 26th and June 20th. This was about the same time that Bitcoin’s price suddenly spiked, after 6 months of relative stability. It’s plausible that the drop happened because people who had capital in NuBits saw how Bitcoin was spiking, and they wanted to get in on the spike, so they sold their NuBits coins in large quantities to buy Bitcoin. The NuBits peg was unable to handle the large sell-offs and broke. The price tanked, and the peg stayed broken for an extended period.